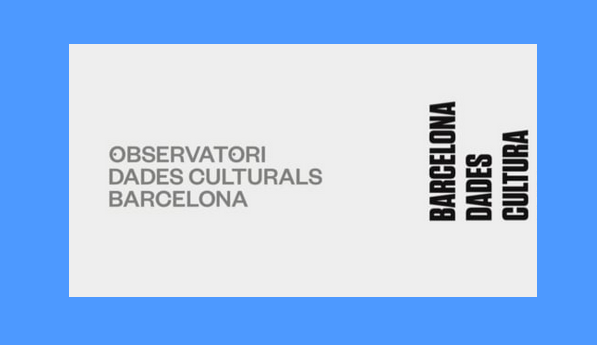 During the next few months, and as the datasets of Culture published in the Open Data BCN portal are being treated, a qualitative change will be made in the datasets containing information on Culture. The data, so far presented so that each dataset contains a single concept, are now organized so that the dataset contains all the concepts that can be analysed together. As an example, the so-called "Visitors to museums and exhibition spaces in the city of Barcelona", "Users of museums and exhibition spaces in the city of Barcelona", "Visitors to temporary exhibitions in the city of Barcelona", "Number of temporary exhibitions in the city of Barcelona" and "Museum collection holdings in the city of Barcelona" are replaced by a single dataset called "Museum and exhibitions' data of the city of Barcelona". On the other hand, the dataset "List of temporary exhibitions in the city of Barcelona" will remain unchanged, since the nature of the data it contains does not allow it to be crossed with any other. The publication formats will not change and will continue to be .csv and .xml. However, the number of visits and downloads will reflect the accumulated number of visits, since the inauguration of the new portal (02/23/2017) of the dataset or datasets that are replaced. This change will mean that the portal presents, in absolute values, a decrease in the number of datasets in favour of a better quality of the published ones. 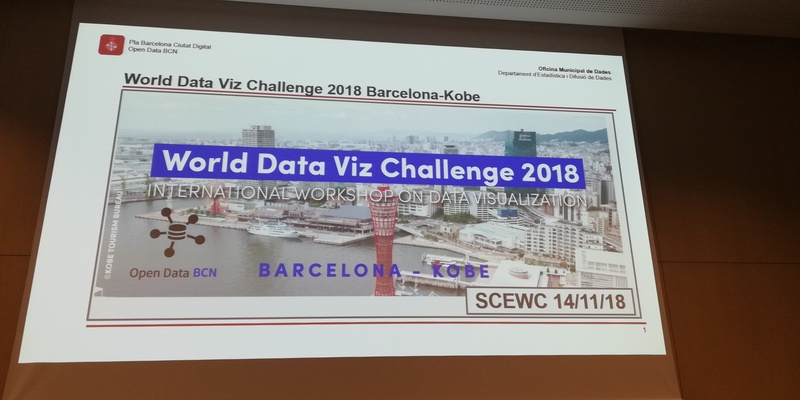 In the framework of the smart city Expo World Congress 2018, yesterday, on November the 14th, took place the public event of presentation of the finalists’ visualizations of the World Data Viz Challenge 2018 Barcelona-Kobe. More than 70 people, including representatives of the local administration and Kobe City Council, the authors of the finalist works, members of the jury and other interested public, attended this event. The event was inaugurated and conducted by Mª Mercè Fígols, responsible for the Open Data BCN service, open data service of the Barcelona City Council and, on behalf of the Kobe City Council, Mr. Taisuke Matsuzaki, Director of ICT Development. The 24 final visualizations of this challenge that was carried out in parallel in Barcelona and Kobe were classified into 4 large groups: Mobility, Incidents, Public Space and Social Portrait to facilitate their authors’ speeches. We saw that Barcelona and Kobe, in addition to celebrating on this occasion the 25th anniversary of their twinning, share concerns and problems. The explanations, the answers and the solutions in the knowledge and initiative of the citizens and the data consist of the consistent, among other repositories, are important to help carry it out. Thanks to all, participants and assistants, to make this event a success! 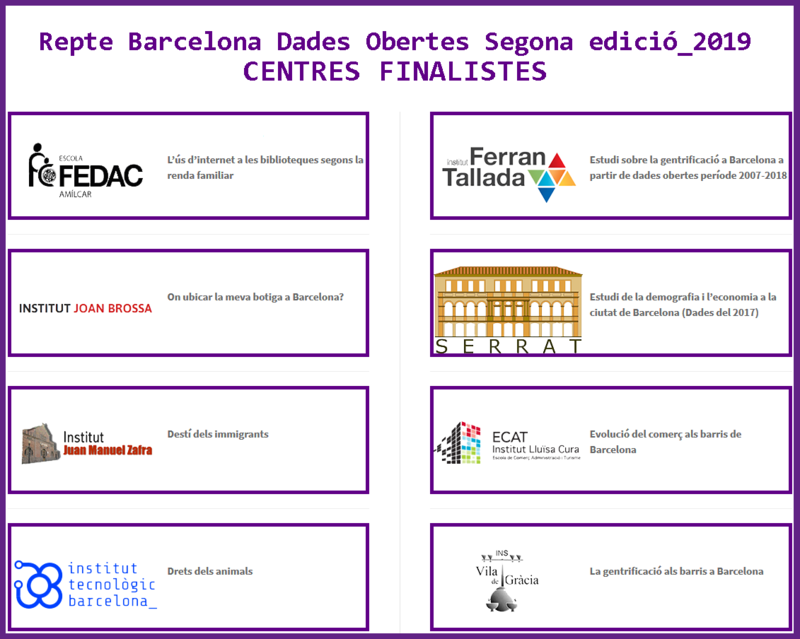 These are the finalist centres of the Barcelona Dades Obertes Challenge Second edition 2019! 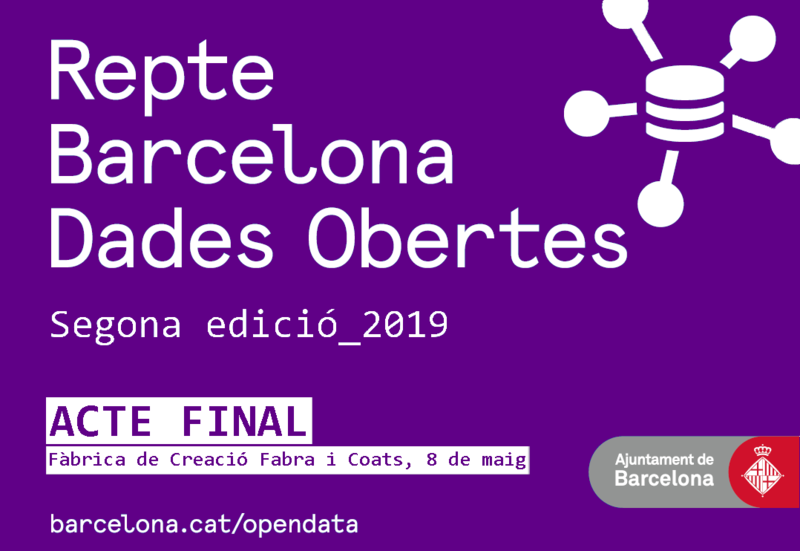 The student representatives will present the projects made with data published in the Open Data BCN Portal in the final act that will be held on May 8th at the Fàbrica de Creació Fabra i Coats in the city of Barcelona, where there will also be an exhibition space for the info-graphics. We eagerly wait for that day when they can share with the entire audience the great work they have done. Reaching the final is already a prize itself. After the success of the first edition, next Wednesday 8th of May, the final event for the presentations of the projects and award ceremony for the Barcelona Dades Obertes Challenge Second edition 2019 will be held at the Fàbrica de Creació Fabra i Coats of the city of Barcelona. In this event, around 200 students from the participating centres of this year’s edition will attend, accompanied by the tutors who taught them among other teachers. The event will take place in the events’ hall of the Fàbrica de Creació Fabra i Coats where there will also be a reserved spot for the exhibit of the infographics the centres have been working on. This will be so the attendants may observe and comment them. During the event, the representative students from the 10 centres the projects of which were the best rated will have 5 minutes to defend their work to their classmates, the rest of the participants and attendants and to the jury, formed by different university professors, renowned experts in data analysis. This year, in the frame of the relations between universities and the Barcelona City Council, the jury board adds Laia Albors Zumel, a 2nd year student of the degree in Data Science and Engineering in the UPC.